1. The embroidered sachet with chinese lucky knots and macrame can be used to hang on walls, doors, and windows during festival. 2. Used for wall decorations, ornaments, promotions, company gifts and souvenirs. 3. Copyrighted designs shown here are for reference only, and no reproduction without proper authorization. 1. 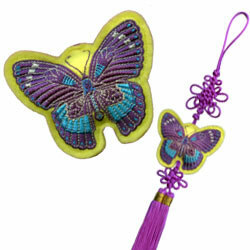 Double-side embroidered sachet is fulled of cotton and with chinese lucky knotes and macrame. 2. Dimensions: 8.6 x 7 cm. 3. Fabric: felt with 80% embroidered. 4. Four colors with silver threads. 5. Border type: cut to shape. 6. Can produce the embroidery based on your own logo/design, you may decide the colors, size, etc.